I know Father's Day is still a few months away but for those of you who want to get on top of your game and plan ahead, I've posted a few things I think would be perfect gifts for the man who likes to be prepared, organized and who already has everything. Sometimes it seems that most men fall into this category! Note, these would also be perfect for a birthday gift too. 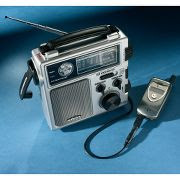 This hand-crank radio from Hammacher Schlemmer that recharges cell phones is awesome. What a fantastic gift! Your name will be praised if an earthquake or hurricane hits and knocks out the power right before your nightly recharge on the desk. Brilliant! Pretty good price point too--$50. 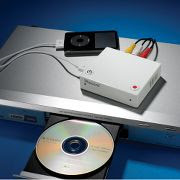 For a group gift (maybe all the siblings can get together to buy this one for Dad) the IRecord is a nice idea. Can you imagine being able to record that "tape" you made for your boyfriend, now husband in college onto your Ipod? I'm so glad Ben still has the tape I made him now that I know about this gadget :) If I bought this for Ben he would always be able to listen to Whitesnake croon and I wouldn't have to worry about my two-year-old unraveling the tape for fun. Apparently the IRecord converts ANY kind of video or audio to an Ipod. Uhh, the word "neato" comes to mind! I know that's so 1993 but it honestly was the first word to come to my mind!